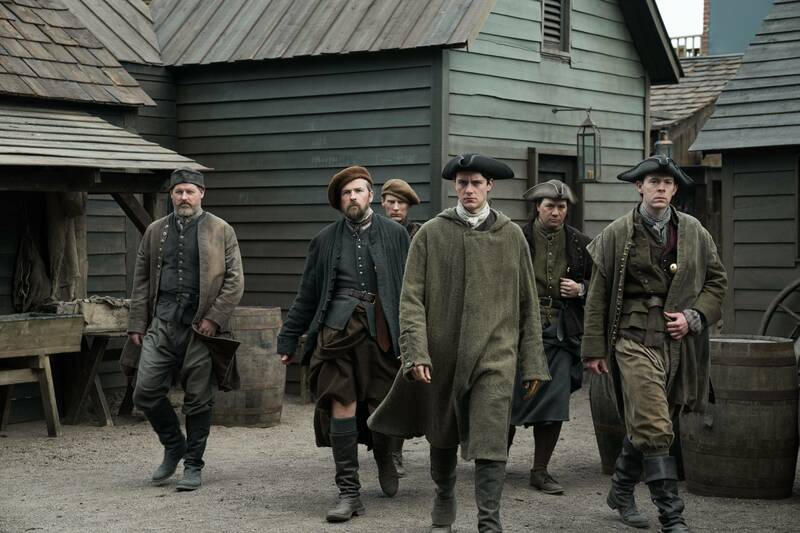 There’s a telling moment in the penultimate episode of Outlander where the most moving moment of the entire season has nearly nothing to do with any of the main characters. It perfectly encapsulates just how far removed this season has become from what made Outlander work so well in the past. There’s no arguing that the most dynamic relationship in the entire series is Claire and Jamie’s, so why in the hell would you relegate them to a 30 second montage while Jamie reads a letter he wrote to Brianna about forgiveness? The dumbest thing Outlander ever did this season was turning Claire and Jamie into supporting characters for Brianna’s story. This is the couple, and the relationship, that so many people are energized for. It’s held audiences strongly for three seasons prior to this, so who thinks it’s a good idea to completely abandon what works and change focus to a relationship and characters that are entirely unlikable? Brianna and Roger are insufferable when they are together, and they’re not much better apart. Hanging the season on Brianna’s story does a disservice to both the show and the audience. I know I’ve said it before, but Sophie Skelton does not have either the charisma or the acting chops to carry the show let alone an episode of Outlander. 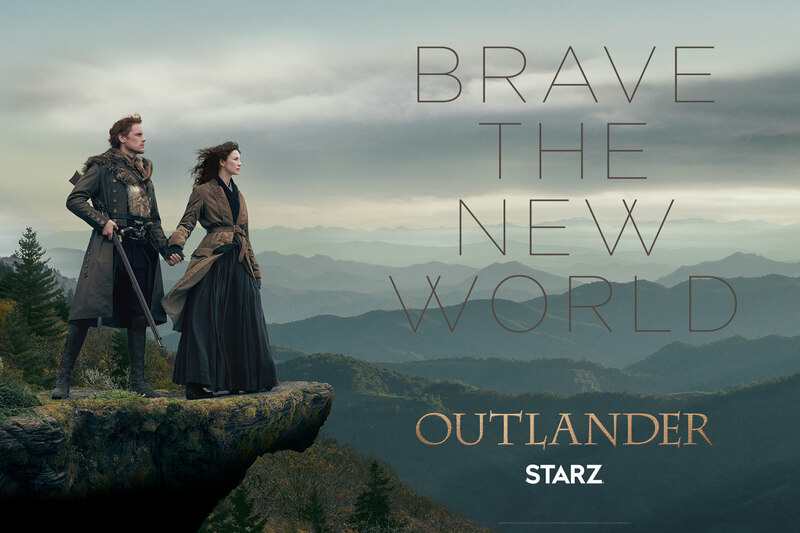 Fergus and Marsali, for how little they’ve appeared in this season, are far more exciting, adventurous, and interesting than Brianna and Roger. Their love for each other is just as fiery as Claire and Jamie’s, and the way Marsali pushes Fergus to join the Regulators and now rescue Murtagh, is reminiscent of early Claire. If you wanted to take some of the burden off of the Claire and Jamie storyline look no further than Fergus and Mersali. The jailbreak he’s planned is badass, and the swagger he has as he and the Regulators pull their pistols on the prison guards is delightful. With only one hand, Fergus carries the episode far better than Brianna, and when their paths do cross, it’s his actions that bear the most weight. Brianna’s insistence on seeing Bonnet, even given Jamie’s letter stating that forgiveness is better than revenge, is ridiculous. Why does she need to confront him to forgive him, why can’t she just let go of her anger without a face-to-face meeting? Though pointless, it’s always good to see Bonnet on the screen. Edward Speleers plays Bonnet with a swagger, even in the face of impending death, that is magnetic. When Brianna tells him she’s carrying his child, that swagger evaporates. In the one moment of kindness we’ve seen from him the entire season, he gives Brianna a ruby (likely stolen from Jamie) to use to take care of the child. 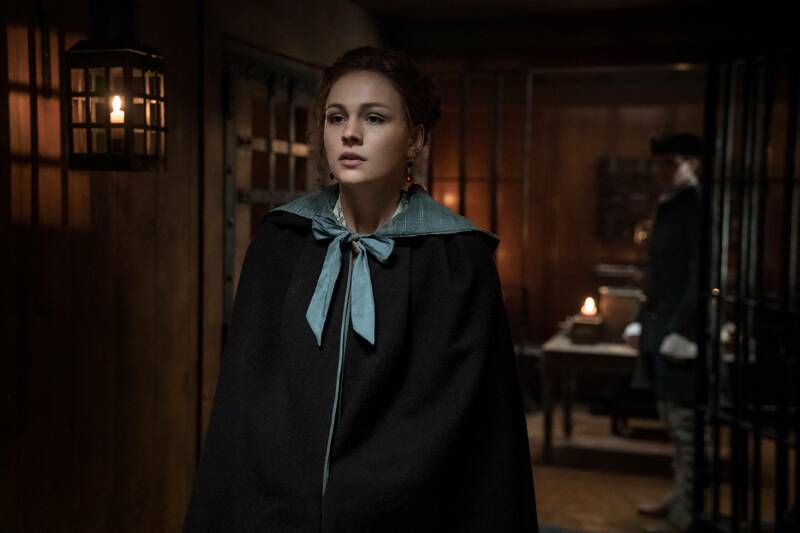 Brianna’s insistence on seeing Bonnet in person is likely the only reason he may have escaped from prison before Fergus and the Regulators blew it up. This probably isn’t the last we’ve seen of Stephen Bonnet. Roger’s imprisonment among the Mohawks at Shadow Lake takes up the bulk of the episode. Richard Rankin is good in the scenes he’s given, but the character of Roger (much like Brianna) isn’t likable, and it’s hard to get too invested in anything that befalls him. 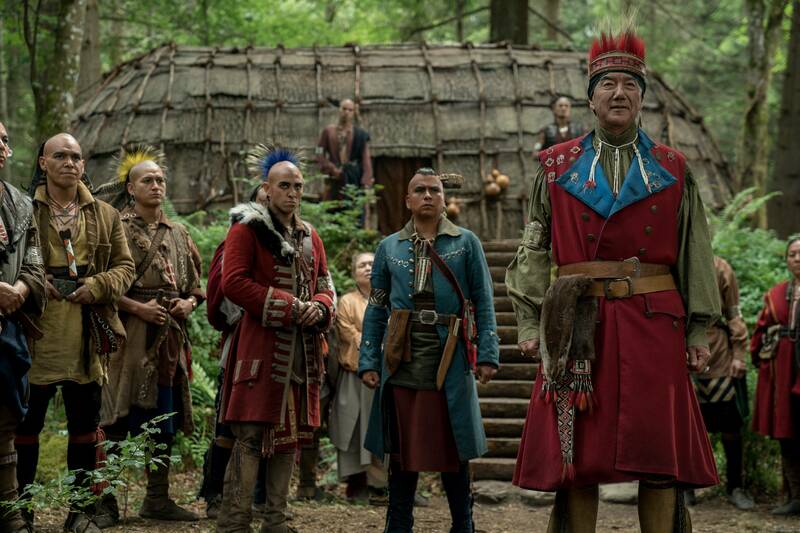 What saves this episode is the relationship between a fellow captive, Father Alexandre Ferigault, and the tribe’s healer, Johiehon. Their loves story, even though it only takes up a portion of this episode, is the most moving moment in the entire season. Ferigault could save himself easily if he wants to, but his convictions as a priest keep him from being able to choose the easy path. Ferigault lived among the tribe after being invited by their Chief to spread Christianity to them. The problem is he fell in love with Johiehon after she nursed him back to health when he fell ill. That love produced a child, whom the tribe wanted baptized, but having fallen from grace, Ferigault wouldn’t baptize his child because of the vow he made to God. He could choose to fake a baptism, he could escape with Roger, but he chooses the Mohawk’s punishment of a slow death instead. He can’t turn his back on his convictions, even if it means losing his life and his chance at happiness with Johiehon. While he’s slowly burned at the stake as the tribe watches, Roger escapes, but the screams of Ferigault are too much for him. Choosing to end Ferigault’s misery wins out over Roger’s drive to escape and be reunited with Brianna, so he races back to the village, grabs a barrel of alcohol, and throws it on the small fire at Ferigault’s feet. This entire scene takes place in slow motion while Adagio for Strings by Samuel Barber plays over it. It’s an emotional scene; more emotional than anything else we’ve seen this season. As the flames from the alcohol engulf Ferigault putting him out of his misery, the real emotional moment takes place. Johiehon has been standing clutching her child, watching her lover dying. As the flames overtake him, she sets her child down and climbs up on the pyre, puts her arms around him, and joins him in death. Braeden Clarke as Kaheroton (who I think is Johiehon’s brother?) gives the performance of the season as we see him silently go through confusion, shock, and then terrible grief while watching Johiehon die clutching Ferigualt. The profound sadness and loss on his face as he holds Johiehon’s child weeping, paired with the music, is an extreme punch to the gut. I’m not going to lie, it brought tears to my eyes. In the aftermath of watching the episode it became clear just how dysfunctional this season of Outlander is. If the most moving moment of the entire season has nothing to do with any of the main characters, or even a featured subplot, there’s something wrong with the show. To be honest, I don’t really care how the season ends, since there’s no escaping the disappointment of this season even if they really nail the finale. I just hope Outlander figures out a way to fix the narrative problems and realign the show’s focus before season five. If that means straying farther from the source material, I’m all for it.